Presented the rhombic prismatic crystals of scarlet-red, carminic-red, light black-red color. Glance (glitter, glare) diamond or semimetallic. A mineral is transparent. It is an example of double-refracting crystal. Associated with a realgar, sphalerite, Pyrite, sartorite, smithite et al rare sulfosalts. One of rare sulfosalts thallium in the dolomites of Lengenbakha (Switzerland). Deposit minefield mine field occurrence subsoil. 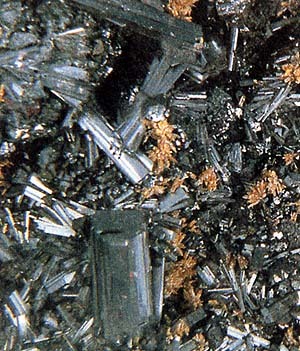 Except for Switzerland, Hatchinsonite is found also in Kirivilka (Peru) as the wonderful extended crystals long to 2 sm. They form different aggregates and Druses with an orpiment, exceptionally correct crystals of enargite, Pyrite and barytes. A mineral not in current the use, therefore is of interest only for collectors.